Rick Ludwin in the Miami University TV studio in 2015. The Williams Hall TV studio where former NBC executive Rick Ludwin got his start will be named in his honor in a ceremony Tuesday, March 19, on the Oxford campus. 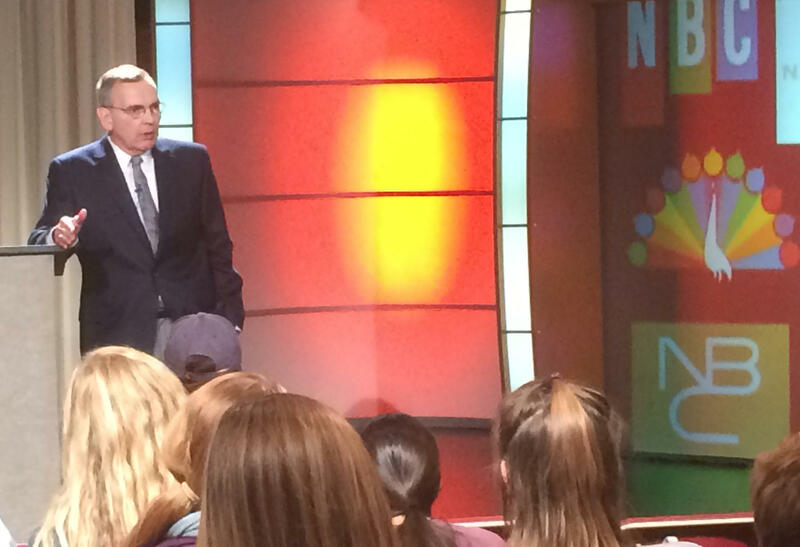 It's a fitting tribute to Ludwin, a 1970 Miami graduate who has returned to the Williams Hall studio for 36 years at his own expense to talk to students about TV trends and answer their questions. Ludwin began his TV career in 1968 hosting Studio 14, a live variety-comedy show produced and written by students on Miami's old WMUB-TV (Channel 14) broadcast station from what will be called the Richard A. Ludwin Television Production Facility. Ludwin speaking to students in the Williams Hall TV studio in October 2015. "I had this love for live television. There was nothing more exciting," Ludwin told me in 2007 for a story in the Miamian Magazine. At that time, Ludwin had a framed TV Guide page behind his NBC desk from Jan. 25, 1968, listing his Studio 14 debut. During his tenure hosting the show, his guests included Cincinnati TV stars Paul Dixon, Bob Braun and Bob Shreve, talk show host Phil Donahue and LSD proponent Dr. Timothy Leary. 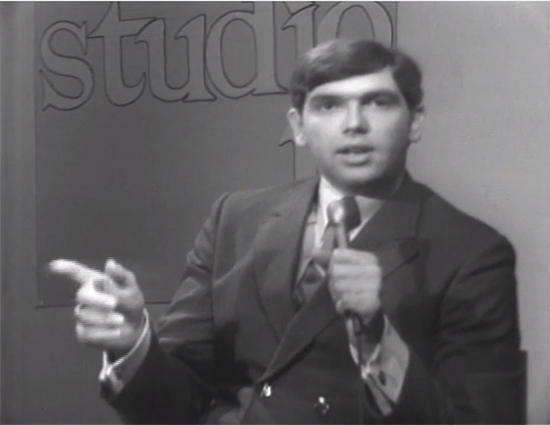 Rick Ludwin hosting 'Studio 14' as a student. Not only have I attended many of his annual talks, but I've also written many insightful stories from his comments about Jerry Seinfeld, Jay Leno, Jimmy Fallon, David Letterman, Conan O'Brien, Johnny Carson, Saturday Night Live and others he worked with at NBC. Seinfeld was launched and nurtured by Ludwin during his 30-year tenure as NBC's senior executive in charge of late night, variety and specials programming. He is the only person in TV history to have worked with every host of The Tonight Show, from Steve Allen (1954) through Johnny Carson, Leno, O'Brien and Fallon. He also supervised Bob Hope's NBC TV specials for decades. The Cleveland-area native has generously funded scholarships for 110 mass communication/media and culture students at Miami since 1993. He also established – and has been the primary funder – for Miami's "Inside Hollywood Scholarship" for 15 students to attend a three-week program of lectures, visits to studios and television networks and job shadowing in Los Angeles. Ludwin also speaks during the program and arranges for celebrity guests. In 2013, Ludwin donated 15 Seinfeld scripts; other Seinfeld and SNL documents; scripts from Hope's TV specials; photos, digitally re-mastered tapes of 30 Studio 14 shows from his senior year (1969-70); and other TV memorabilia as part of the Rick Ludwin Collection to Miami's King Library. Fifty years ago today, WLWT-TV broadcast one of the most memorable telecasts in Cincinnati history: the wedding of two rubber chickens. On a live broadcast of the Paul Dixon Show. Why do Jimmy Fallon and Conan O'Brien do fewer President Trump jokes than Stephen Colbert or Seth Meyers? Why aren't some late-night TV hosts very political?